Salt and Water: How Much is Too Much? What Are You Doing May 17th? Send Your Mom an Original Jewish Home e-Card! A decade and a half ago, a third grade teacher from Balboa Magnet School in Northridge teamed up with the Jewish Home activities staff. The goal was to bridge the intergenerational gap, pairing third graders with residents at the Home for a year. Once a month, the students would take a field trip to the Jewish Home, and participate in fun activities with their "buddy". Four years ago, a third grader named Olivia was paired with a Jewish Home resident named Ida. During the year, they formed an incredibly close bond, and continued to chat with each other over the following year. Unfortunately, at 93 years old, Ida passed away in 2008. 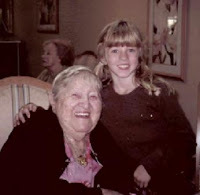 And, following her grandfather's passing in 2010, Olivia resolved to create a program similar to the one where she met Ida — one where children of all ages could form a special bond with a senior in their communities. The fledgling organization is appropriately named, Friends of Ida. Olivia, we're with you 100%! If there's anything the Jewish Home can do to help, please let us know. For more information on Friends of Ida, click here.